YES, I WANT THE FREE SAMPLER! Submit your email and we'll deliver your confirmation and free downloads straight to your email inbox! Easter is the perfect time for you and all the members of your church or small group to invite someone to church. And what better way than with The Easter Code, a 40-day devotional for the Lenten season? This beautiful little booklet can be purchased in bulk for as little as .99 cents, making it one of the most effective and affordable outreach tools you can buy. Invite your whole church on a journey of Christ through the places, people, and events in His life all the way to His resurrection. 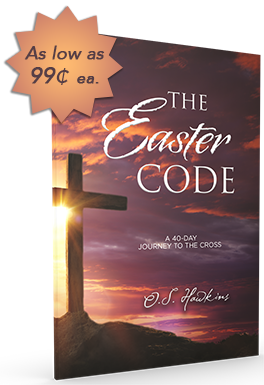 The Easter Code, by bestselling author O. S. Hawkins, is a meaningful 40-day devotional booklet for the Lent season. Each day includes Scripture, a devotion, a prayer, and a Code Word to think on during the season. This unique element will create a profound experience as you prepare your heart and mind for Easter Sunday. Sign up to receive a FREE Easter Code Sampler, plus all the additional FREE resources (downloads) we have created to help you bring the joyous message of salvation to your community this Easter season! All author royalties from the book are donated to Mission:Dignity, a ministry that helps men and women who have faithfully served God’s people for modest pay retire with well-deserved dignity, independence, and often the ability to continue serving. What’s Inside the FREE Easter Code Sampler? The Easter Code Sampler includes the first seven days of devotionals taken from the complete booklet. The sampler will let you see how wonderfully easy it can be for you to draw people both inside and outside your church into the sacred meaning at the heart of Easter. How Can I Use The Easter Code Booklets? Tuck an invitation to your Easter Sunday service inside the booklets and hang them on the doorknobs of homes in your community. Give them as gifts to your church members or first time visitors before the Lenten season begins and invite them to take a meaningful 40-day journey to prepare their hearts for Easter. Hand them out at senior centers, crisis pregnancy centers, community youth centers. The Easter Code booklets are an affordable and easy way for your church to celebrate and share God’s love at Easter with everyone in your community. YES, I WANT THE SAMPLER AND FREE RESOURCES! Pastors have used The Christmas Code booklets to reach thousands of unchurched people across the country! Listen to what they are saying then think about how The Easter Code booklets can help you reach people in your community!